Back in 2008, ComeOn rose onto the online sports gambling scene and straightaway they targeted mobile players with a betting app. Most online sportsbook back then were solely focussing on players who bet from their computers, which made ComeOn one of the mobile gambling trailblazers of the era. Their mobile betting app can be found and played from iOS, Windows and Android systems, so no players ever feel left out. If you’re hesitant about downloading a mobile app or software to your phone or tablet, good news! ComeOn’s mobile betting features can be accessed through your favourite mobile browser. The app is a perfect representation of what you’d expect to find from the betting website and is optimised in a way that it even rivals the loading speeds of the sports and matches you wish to bet on. Players can find all their favourite sports from the desktop version of the site, so there’s no quality sacrificed whatsoever when using the ComeOn Sports app. If you enjoy other forms of gambling, such as online casinos, you’ll be happy to know that ComeOn also have mobile apps where you can play your favourite casino games. Navigating to the promotions is simple enough to do and all the different bonuses and promotions you’d expect to find on the desktop site are found and claimable from the ComeOn betting app. As mentioned before, you can find all the different bonuses that ComeOn feature with little to know effort and this includes their fantastic welcome bonus! New players who sign up through ComeOn’s betting app can receive a £10 free bet to use across their stunning sport markets. Players are required to make a £10 or more deposit and bet of the same amount (or higher) from the betting app or website. Once these requirements have been met, ComeOn will deposit the £10 free bet into your account to use. Below are some of the other sports offers you’ll find at ComeOn. Virtual Sports – ComeOn are prepared to part with £10 each month which you can use to bet on Virtual Sport markets. All you need to do is bet £10 on the virtual markets and ComeOn will do the rest! Parlour’s Predictor – We all love making a risky acca and now the former Arsenal midfielder will make Premier League predictions every weekend, giving you the chance to bet against him. To take advantage of this, you’ll need to bet at least £10 on markets which have a minimum of ½ on Saturday and Sunday’s games! If you manage to out-guess him, you’ll get a £5 free bet and if all your predictions are right, ComeOn are prepared to give you a £50 free bet! Other Promotions – ComeOn are also known for their quality casino section and there are plenty of promotions which you can find that will help you get off to a flying start at your favourite poker games, online slots and much more! Plus, all these can be too be accessed from the mobile app, so there’s never been a better time to start playing. Betting on football is a staple of every English football fan and with the Premier League, you can be assured that there’s never a dull moment to bet on. ComeOn Sports recognises this, which is why they’ve chocked their mobile sports app with a huge amount of football betting markets, all of which can be accessed from your fingertips. You can navigate to the football betting section by using a couple of different ways. The first is by simply selecting it from the regular sports menu, via the app. The second is to visit the in-play betting section, which will then present you with all the live football games happening, betting markets and the odds. We love any sort of racing but the two that are by far the most popular in the United Kingdom is greyhound racing and horse racing. If you plan on placing a cheeky wager on the horses, you’ll be pleased you found the ComeOn betting app, as it lets you bet on any live races happening within the UK at just a tap of the screen. If you’re an avid fan, you might want to check out what markets they have, as there’re in abundance. ComeOn Sports has gone to the trouble to include horse races happening all over the world! Live betting markets or ‘in-play betting’ has revolutionised online and mobile betting as we know it. It’s one thing being able to bet on your favourite sports with real-time odds but being able to do it from anywhere in the world is straight up spoiling us! ComeOn doesn’t see it this way, though, and they have a massive array of sports betting markets which you can choose from under the in-play section. The in-play console from the computer transfers over to the mobile app incredibly well. The cash out feature has revolutionised how we place sports bets and if your bet is heading south or was randomly placed and is doing much better than it should, you’re given an option to cash out and quit whilst you’re ahead! Again, hats off to the ComeOn sports app, as they enable players to cash out via mobile, as this is both fun and incredibly useful. You can find the cash out feature by heading over to your bet slip. The app is easy to find and download for both Android and iOS users. To do this, you need to simply search for ‘ComeOn Sports’ on the Google Play Store or iOS App Store. Depending on your internet connection, your app will be promptly downloaded and as soon as your login or create your new account, you can begin playing immediately! ComeOn literally offer their entire sportsbook to players but in the mobile format and is by far one of the betting mobile betting apps out there, that we’ve tried. Players have full access to all the bonuses and promotions available. 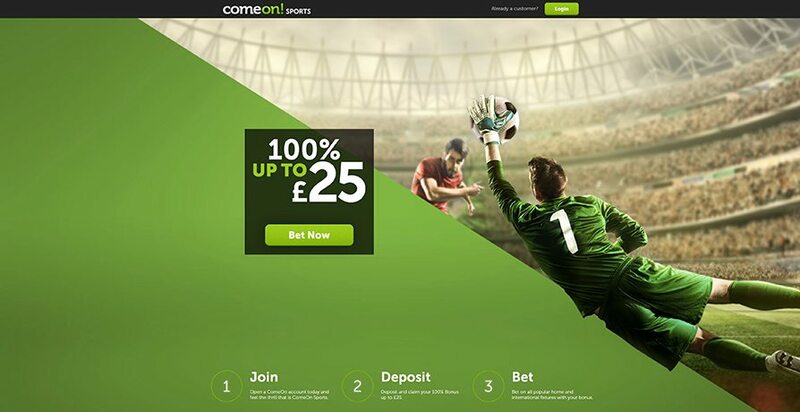 If you’re in the market for a reputable mobile sportsbook which even has a superb betting app and a huge array of betting markets and promotions for you to claim, ComeOn mobile betting application is a perfect way of taking advantage of all this.